Our SLAM Scan® technology is already used in over 1M devices and has several different application areas. Dacuda LTL is the world’s high-resolution software solution for professional wide-angle photography. While moving the phone in a random pattern, LTL stitches images together seamlessly in real-time and creates a very high resolution wide angle image. Leading smartphone OEMs include Dacuda LTL as part of their native camera app. Dacuda's technology also helps you to be more productive. Our SLAM Scan® engine is combined with powerful OCR, enabling instant editing of text and tables as well as scanning of large documents. 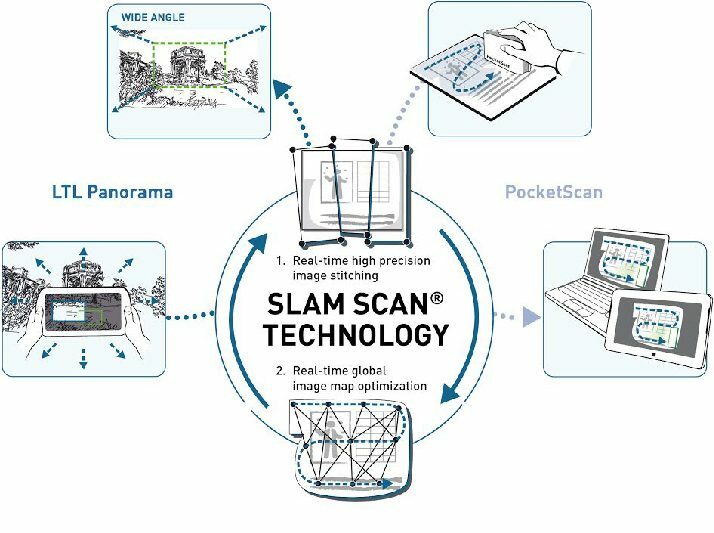 SLAM Scan® is also available to boost the productivity of mobile device users, simply using the built-in camera to be faster and more accurate than typing. It powers the world's first scanning mouse as well as the Kickstarter sensation - PocketScan. Dacuda's Rapid Input technology allows for the instant detection & extraction of MRZ information (Passport-, ID-, Drivers License-Information) in the fastest and most accurate manner of any MRZ reader currently on the market. The MRZ reader is compatible with passports and driver licenses from around the world. The easy to use interface, with both portrait and landscape support, guides the user with live feedback for best results. The entire solution functions entirely offline, making it ideal for almost any application. It has been built with compatibility in mind and integrates quickly and seamlessly into other applications.